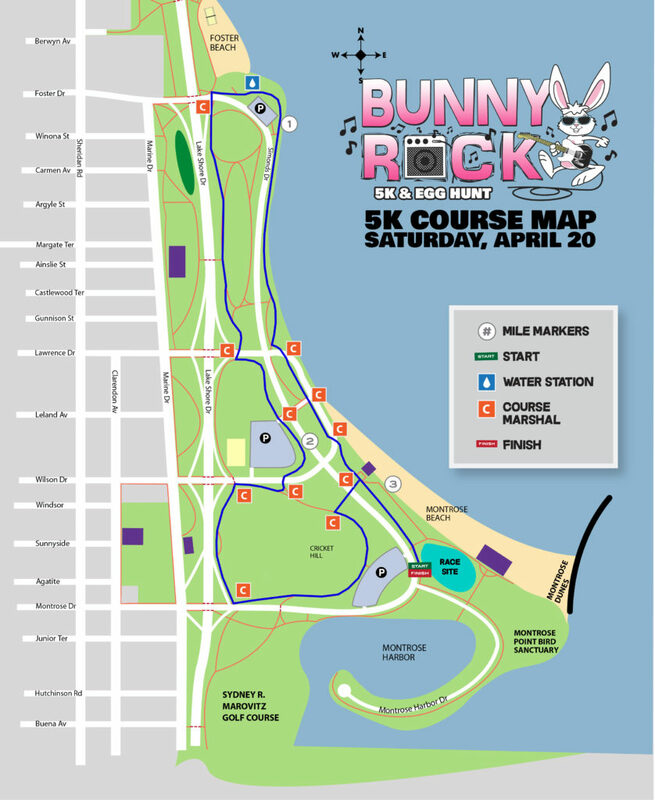 Join us Saturday, April 20, 2019 at Montrose Harbor at 9:00 A.M. (5K) and 10:15 A.M. (Egg Hunt) for the Ninth Annual Bunny Rock Chicago 5K and Kids Egg Hunt. This festive race is sure to bring lots of excitement and entertainment with 80s rock music being played at the start and finish line, amazing amenities, and an overall fun, spring-filled race! Access to a huge live petting zoo with over 20 animals, including ducks, goats, lambs, donkeys, and more! The top three Male & Female Finishers in each age group for the 5K will receive a customized medal. The top three overall Male and Female Finishers will receive a customized Bunny Rock Mug! Free parking is available around the streets at Montrose Harbor. There is also a parking lot across the street from Montrose Harbor where you can park at a small fee per hour. We strongly encourage carpooling or taking public transportation as parking may be somewhat limited. The Wilson Red & Purple CTA lines are only a few blocks away from the start as well. Gear Check: Volunteers will collect and store the participants gear until it is picked up after the event has completed. Course Marshal: Volunteers will be on the course directing participants, assisting with traffic control and monitoring the safety of all participants and spectators. Water Station: Volunteers will serve water and endurance drinks to participants at specific locations along the course. Start Line: Volunteers will direct participants to line up in corrals and keep the start line orderly. Finish Line: Volunteers will be stationed at the finish line to direct participants through the finish area and to make sure the area is safe and secure. They will also pass out food/beverages to runners as they finish. Kids' Egg Hunt: Volunteers will help distribute the eggs and monitor the Kid’s Egg Hunt. Head over to the Bunny Rock Chicago website to volunteer! Where do I find my 5K time? - Results will be posted on-site, as soon as possible following the event and official results will be posted on the Bunny Rock website within 24 hours. How was Bunny Rock Chicago?